Bubble Bath – Put some bubble bath in the bathtub and run the water with really high pressure when filling up the tub to make big, fluffy bubbles. Your toddler will be practically begging you to jump in and play around in those scrumptious, soapy, cylinders (see photo). Bath Toys – It seems like a no-brainer to use bath toys, but what are the right bath toys? We find that squirt toys work really nicely (the ones you can fill up with water and then squirt it around). Different kinds of buckets and watering cans are also really fun. A spray bottle – this is like a bath toy, but is a lesser-known bath toy. It works really well for us when all other bath toys fail. Get a clean spray bottle (not an aerosol spray can of course, just one of those spray bottles that you would use to spray water on plants and such – ask your wife if you don’t know what I mean), and fill it up with water. Let your toddler hop in the tub and spray away. I don’t know why, but Smarty Pants loves this. Hop in there with him! 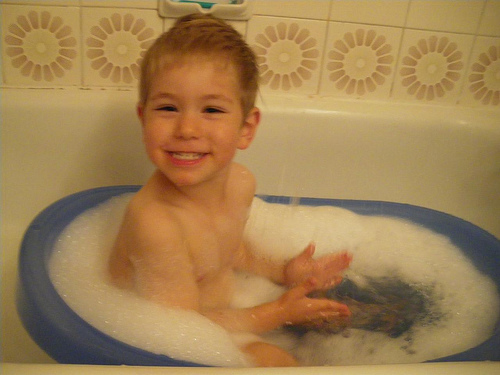 – You can make bath time a lot more fun and enjoyable by getting in the tub with your toddler and playing with him. Whether by pouring buckets of water on him or spraying him with the squirt toys, he will have a hoot and you will too. Quality time and stress relief are also included in this package at no extra charge. A special bath tub - We have a smaller-sized bath tub that we actually bought to bathe Sweet Cheeks, but it is big enough for a toddler too. Sometimes when Smarty Pants doesn’t want to bathe in the big bath tub, we pull out the smaller bath tub, put it in the bigger bath tub, and fill ‘er up (see photo). This usually works, and it also saves water! Focus on the positive – If your child cringes every time you say, “It’s bath time!” … then don’t say it! Say something like, “It’s time to play with your buckets!” or, “Let’s go spray water with your spray bottle!” You are much more likely to get an affirmative response, because the focus is on fun and play, and not on the dreaded “bath” or “shower.” I owe this one to Love Buns, who put this idea into practice today with much success. So there you have it. Some simple, practical ideas that have helped keep Smarty Pants clean between the toes, while giving him and us some enjoyable bath times, and a consistent bed time routine. It’s like getting three scoops of ice cream for the price of one. Mmmm… ice cream. Do you have any other ideas or tips for getting your child to take a bath? What works for you? Leave a comment and let us know. I love this article! The pic is great! I’ve tried 1 through 4 and 6 and they haven’t worked. My little one seems to be afraid more than reluctant. Hi Natalie, yes, that could be the case – in my case it was more reluctance. I hope you find a way! Love this bath pic! He’s so cute! My son won’t take baths no matter how positive we are or how fun we make it; nothing works!